In the past decades, Thailand has experienced a large number of migrants from Myanmar who came to Thailand in search for better economic opportunities, creating a magnitude of migrant population residing in Thailand. Among these migrants, children make significant percentage in migration to Thailand since some children accompany their parents while some are migrant themselves who came to Thailand in search for jobs. In addition, migrant children include those who were born to migrant parents in Thailand. Due to the large number of migrant children, providing education for them became state concern both in response to international obligation that Thailand is a state party and for the attainment of national security. As a result, the government of Thailand has adopted a policy providing free and compulsory education for every child within its territory. However despite the effort of the government in providing education for migrant children, many of them are still unable to access the right they are entitled to. 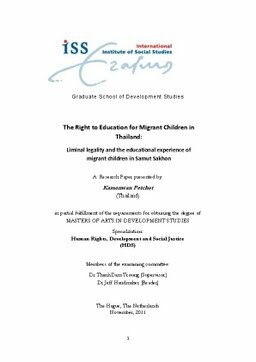 This qualitative research examines the situation of right to education for migrant children in Samut Sakhon with emphasis on the role of schools as institutional duty bearers in fulfilling their legal obligation as stated in the government policy as well as in the Convention on the Right of the Child of which Thailand is a state party. Rights-based approach and the 4As scheme are used as a tool for analyzing the situation of education provision for migrant children. In addition, this research analyses the precarious status and its impact on migrant children‟s right to education. The concept of „liminal legality‟ is used to conceptualize the in-between status of migrant children and families and how this liminal status shape the opportunity structure of migrant children in education by influencing household decision making. Liminal legality plays ital. role in not only migrant children‟s educational opportunity but also their incorporation.